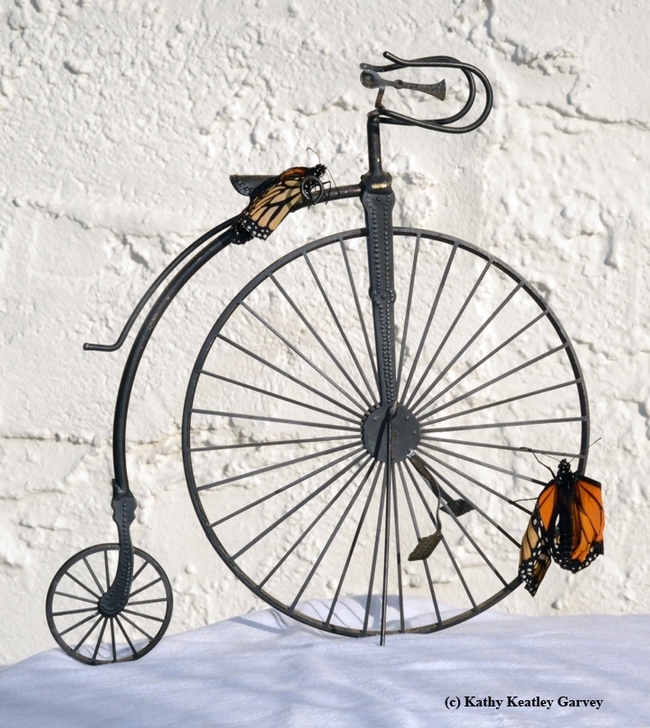 Not all monarch butterflies that you rear will make it. 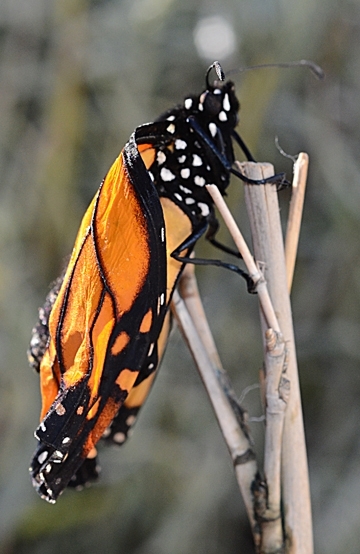 Such was this case this week with when two monarchs eclosed, both crippled and struggling to survive. The damage to their crumbled wings may have occurred when, as jade-green chrysalids, they fell to the floor of the mesh butterfly habitat. We gently picked them up, tied dental floss around each cremaster, and hung them back up again in a scene reminiscent of Christmas stockings hung by the fireplace. No. 21 eclosed. Then No. 22. But these monarchs, the last of the season, needed names instead of numbers. The first one we named "Tiny." The second one, "Tim." They were named after the fictional character, Tiny Tim, from the 1843 novel A Christmas Carol by Charles Dickens. Tiny Tim couldn't walk but he brought joy to the Bob Cratchit family and he changed the heart of Ebenezer Scrooge. Life is as good as can be expected. We're rolling cotton balls in a sugar/water mixture (with a dash of soy sauce for vitamins and minerals) and they're eating. They're climbing on the lantana blossoms during the day. At night they scurry to a roost at the top of the habitat and remain there until morning. Yesterday, we took them outside and placed them on the spokes of a miniature penny-farthing (big wheel bicycle). They soaked up the warmth of the afternoon sun and seemed energized. But when they tried to fly, they tumbled to the ground. Maybe due to Ophryocystis elektroscirrha (OE)? Now they're back inside the house, cozy in their butterfly habitat with the fresh lantana and newly soaked cotton balls and Adele singing "Hello" on the CD. They're not going to make it. We know that. They can flutter but they cannot fly. They can feel the warmth of the sun but they'll never migrate, overwinter and feel another warmth--the warmth of a cluster at the top of an 80-foot eucalyptus tree. 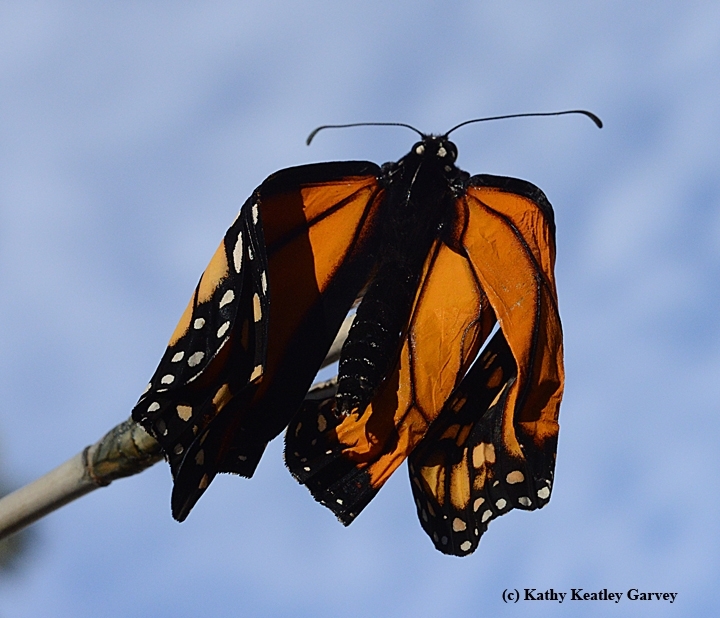 Butterfly guru Art Shapiro, distinguished professor of evolution and ecology at UC Davis, said it best: "Life is hard." About 1 percent of caterpillars make it to adults, he said.